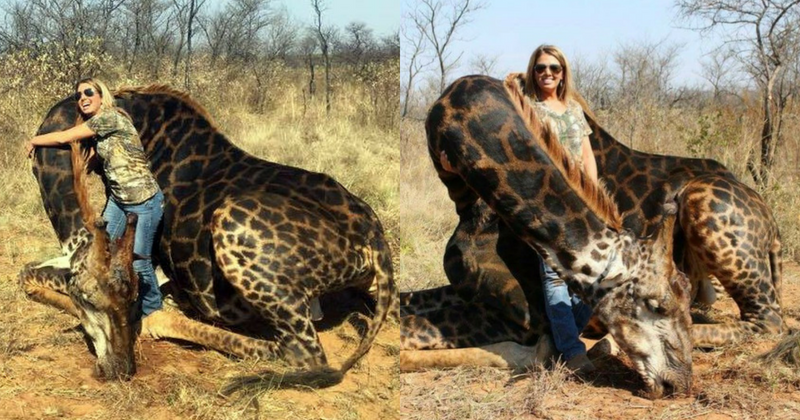 An American hunter was called out on social media after sharing pictures from her hunt in South Africa, where she killed an endangered black giraffe. Trophy hunting is a widely decried sport, with intense controversies raging all over the world every time a new incident involving an endangered or protected species comes to light. American trophy hunter Tessa Thompson Talley was no exception. Talley went on a hunting trip to South Africa, where hunting is quite a booming industry, and she posed with a number of animals she had shot and killed while on the trip. However, none attracted as much backlash as the picture she posted of her posing next to a black giraffe she had hunted. She shared the picture with the caption, "Prayers for my once in a lifetime Dream hunt came true today! Spotted this rare black giraffe bull and stalked him for quite awhile. I knew it was the one. He was over 18 years old, 4,000 lbs and was blessed to be able to get 2,000 lbs of meat from him." Africa Digest initially picked up on the trophy hunter's photos and shared them to Twitter, deriding Talley with the caption, "White American savage who is partly a neanderthal comes to Africa and shoot down a very rare black giraffe courtesy of South Africa stupidity." It did not hesitate to out the woman. "Her name is Tess Thompson Talley. Please share. If our so-called governments can’t care for our wildlife then its time we stand up and responsibility of our continent, lands, resources, and wildlife…. share share share! and let’s have a united voice against pillage of Africa, it’s the only home we have." A number of users on Twitter picked up the tweet and shared it, calling for other users to send her messages on Facebook expressing outrage at her killing of a rare animal faced with the threat of extinction. In response, Talley made her account private, preventing people from commenting on her photos. South Africa stands to gain from the commerce generating by the trophy hunting trade, but it comes at the cost of losing its wildlife populations, especially those animals that are threatened with extinction. Many people let out their land so that trophy hunters and tourists can hunt down exotic animals to take home as trophies. A number of countries have cracked down on trophy hunting as a tourist activity and have banned the sport, especially after the famous killing of Cecil the lion in Zimbabwe. Kenya, Botswana, Brazil, and India have declared trophy hunting illegal, and other countries like France, the Netherlands, and Australia have banned trophies of lions from being imported.